De Dietrich Process Systems offers a broad range of reactors and components manufactured from Borosilicate Glass 3.3, providing excellent resistance to chemical attack and corrosion as well as transparency for optimum visual observation. Learn more about the internal components of glass reactors and the advantages of this construction.Our QVF glass reactors meet a wide variety of process applications and volume requirements ranging from laboratory scale and pilot plants to full scale production units. 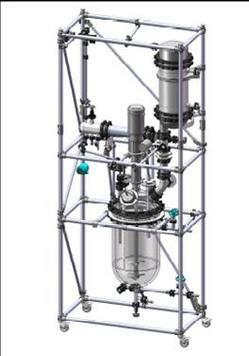 QVF reactors are available in a variety of shapes including spherical, cylindrical, and graduated cylindrical as well as a range of sizes to meet multiple processing needs. Many standard sizes and designs are kept in stock for quick delivery. 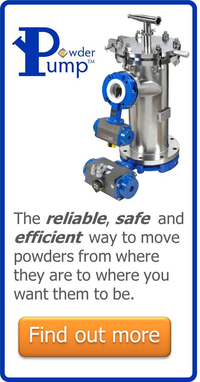 Our diverse product line, including Q Series units, OptiMix wall-mounted baffle reactors, as well as custom units, with various accessories and instrumentation provides the optimum solution for virtually every type of application involving a reaction unit. The QVF Standard Reactor Series are made of borosilicate glass 3.3, which combines process visibility, purity, corrosion resistance, and long term service. Complemented by other highly corrosion resistant materials such as PTFE, SiC and De Dietrich Glass Lined Steel, the QVF Glass Reactor Series can handle a variety of functions. 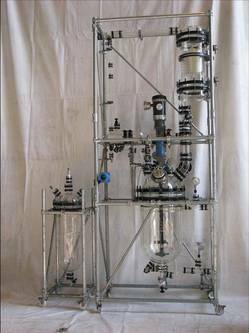 The Q series reactor is widely used in research and development as well as kilo plant production applications throughout the chemical, biotech, and pharmaceutical industries.